Republic Day parade 2018 LIVE updates: At Rajpath, 10 Heads of States of ASEAN nations are chief guests. They are accompanied by President Ram Nath Kovind and Prime Minister Narendra Modi. Follow for the latest Republic Day 2018 updates. 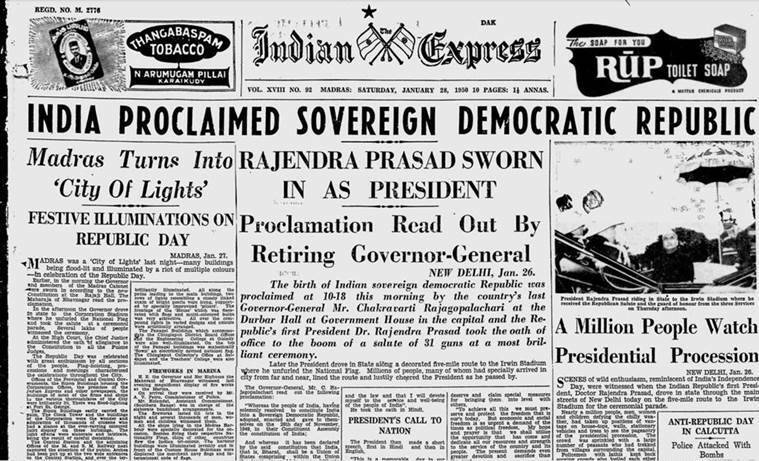 Sixty-nine years since the birth of its Constitution, the nation celebrates Republic Day on Friday with a grand parade at Rajpath. In a first, 10 Heads of State, of ASEAN countries, are chief guests at the parade. Taking to Twitter, Prime Minister Narendra Modi Friday greeted the nation this morning on the occasion. 11.53 am: Meanwhile, our Punjab correspondent reports that that a cop has shot himself during the official Republic Day parade in Jagraon. Cop Manjit Singh, deputed as gunman of SHO Jagraon City, died on the spot after shooting himself with his AK47. 11.51 am: This year, West Bengal’s tableau, ‘unity in brotherhood,’ was rejected by the Centre. Here’s a picture of the state’s tableau back in 1956, which shows Shri Chaitanya, Vaishnava Saint preaching a message of universal brotherhood. 11.40 am: The President is being escorted back to the Rashtrapati Bhavan. 11.27 am: Next in line is the Tejas formation, comprising three LCA aircraft Tejas, fly past in a ‘Vic’ formation. The flypast ends with a Su-30 MKI carrying out a ‘Vertical Charlie’ manoeuvre over the saluting dais. This concludes the parade! The National Anthem will be played now. Tri coloured balloons fill the sky! 11.24 am: Now, the flypast by the Indian Air Force (IAF). The ‘Rudra’ formation comprising three ALH Mk IV WSI helicopters in ‘Vic’ formation, is followed by the ‘Hercules’ formation comprising three C-130J Super Hercules aircraft in ‘Vic’ formation. Following close behind is the ‘Netra’ an Airborne Early Warning and Control System Aircraft also known as “Eye in the Sky”. 11.25 am: Other stunts being displayed by the ‘Seema Bhawani’ include Fish Riding, Side Riding, Faulaad, Prachand Baalay Shaktiman, Four Harmony, Mobile PT, Bull Fighting, Peacock, Sapt Rishi, Brahma Yog Guldasta, Wind Mill Formation, Seema Prahari, Bharat Ke Mustaid Prahari, Sarhad Ke Nigheban and Flag March Pyramid. 11.20 am: The Women’s Motor Cycle team ‘Seema Bhawani’ of the Border Security Force (BSF) is displaying formations for the audience. On of the main attractions this parade, they’re showcasing different skills and stunts, including a Salute to President! The motorcycle team is led by Sub Inspector Stanzin Noryang. 11.10 am: India’s ties with ASEAN are being showcased. Remember, this year marks 50 years of ASEAN’s incepton and 25 years of India’s partnership with the bloc. Leaders from the 10 countries, Indonesia, Malaysia, Philippines, Singapore, Thailand, Brunei, Cambodia, Laos, Myanmar and Vietnam, are seated among the audience witnessing the parade today. India’s historical, educational, religious and cultural links with the ASEAN nations is being showcased. 11.07 am: There are more than 800 boys and girls dancing in the parade now. They are students of schools in Delhi. 11.05 am: Now, 18 children, including seven girls selected for the National Bravery Award 2017, will participate in the parade. Three of these children have been awarded posthumously. 11.00 am: A tableau showcases “Khelo India”, a national initiative of the government to develop sports across the country. The tableau depicts various sports. The Ministry of Tribal Affairs displays its flagship scheme Uchith Dam Hak Se Maang for minor forest produce sector. 10.55 am: The tableaux of Punjab, Himachal Pradesh roll down Rajpath. Manipur showcases its most popular folktales of Khamba and Thoibi, while Gujarat depicts the Sabarmati Ashram, which completes 100 years this year. 10.45 am: States and Union Territories roll down their individual tableaux, showcasing the diverse historical, art and cultural heritage of the country. Uttarakhand focuses on rural tourism, Karnataka its flaura and fauna (home to part of the Western Ghats!) and Tripura exhibits its beauty and elegance. Maharashtra shows the coronation of Shivaji, while Lakshadweep shows off its islands. The tableaux of Chhattisgarh, J&K and Assam roll down Rajpath as well. 10.40 am: An ASEAN tableau rolls down — this is the second to feature in the Republic Day parade. The marching contingents wave the ASEAN flag as well as the flags of the 10 ASEAN countries. 10.36 am: The NCC Boys’ Band and the NCC Senior Division Boys Marching Contingent are coming down Rajpath. They’re playing Kadam Kadam Badhay Ja. 10.34 am: The next marching contingent is the Sashastra Seema Bal. They are marching to Josh Bara Hai Seene Mey Hai Hathelyo Par Jaan. Their motto is Service, Security and Brotherhood. This is followed by the marching contingent of the Indo-Tibetan Border Police (ITBP), playing the famous Saare Jahan Se Acha Hindustan Hamara! The Delhi Police is next, whose motto is ‘Shanti Seva Aur Nyaya’. 10.30 am: Did you know? The Camel mounted band of the Border Security Force (BSF) is the only one of its kind across the world? It marches to the tune of Ham Hai Seema Suraksha Bal. 10.27 am: Paramilitary and other auxiliary civil forces are marching down Rajpath. The contingent includes the Border Security Force, Camel Contingents, Indian Coast Guard, Sashastra Seema Bal, Indo Tibetan Border Police, Delhi Police, National Cadet Corps and National Service Scheme. 10.25 am: An Indian Air Force Tableau rolls down Rajpath with the theme “Indian Air Force Encouraging Indigenisation”. The models displayed in include the Tejas Multirole Fighter Aircraft, Rudra Helicopter, Arudhra Radar and Akash missile system. The contingent comprises 144 men, led by Squadran Leader Attal Singh Shekhon. There are three women part of the contingent as well. 10.23 am: The Naval Brass Band marches down Rajpath, playing Jai Bharati. The contingent comprises 144 young sailors, led by Lieutenant Tushar Gautam. The tableau showcases the combat potential of the multi-dimensional Indian Navy. 10.21 am: The tableau of Ex-Servicemen is marching under the theme “Veterans- an Asset to the Nation.” The contingent comprises veterans including Marshal of Air Force Arjan Singh DFC, Field Marshal SHFJ Manekshaw MC and Field Marshal KM Cariappa OBE of Indian Army. 10.17 am: The marching contingent of the Army includes horse-mounted columns of the 61st Cavalry, the Punjab Regiment, Maratha Light Infantry, the Dogra Regiment, Ladakh Scouts, the Regiment of Artillery and 123 Infantry Battalion – Territorial Army (Grenadiers). There is also a tableau of Ex-Servicemen. 10.10 am: Showcasing her military might, the main draw of the Indian Army depicts the T-90 tank (Bhishma), Ballway Machine Pikate (II/IIK), Brahmos Missile System, Weapon Locating Radar (Swathi), Bridge Laying Tank T-72, Mobile Base Transceiver Station and Akash Weapon System. 10.05 am: IAF Garud Commando Corporal Jyoti Prakash Nirala is posthumously awarded the Ashoka Chakra, the country’s highest peacetime gallantry award. He is awared for his role during a counter-terrorist operation in Jammu and Kashmir where he single-handedly gunned down two militants and injured two others. He is the first-ever IAF airman — the equivalent of a jawan in Army — to get the gallantry medal for a ground combat operation. 10.00 am: Meanwhile, India just secured a spot in the semifinals of the ICC U19 World Cup, after beating Bangladesh. They’re set to play Pakistan in the semis on January 29. Save the date! 9.52 am: President Ram Nath Kovind, Prime Minister Narendra Modi, Vice-President Venkaiah Naidu and the ASEAN leaders are seated at a dias to witness the Republic Day parade. The President takes the salute to the National Anthem. The parade is about to begin! 9.43 am: PM Modi is welcoming the ASEAN leaders. They will be seated on a bullet-proof dias, from where they will watch the Republic Day parade. The marching contingents will bear the ASEAN flag and the flags of the ASEAN countries this year as well. 9.40 am: President Ram Nath Kovind is being escorted to Rajpath by 46 Bodyguards on Bay and Dark Bay coloured mounts. He will be seated on a dias along with the chief guests for the event, the 10 ASEAN leaders. He will be accompanied by the Prime Minister and Vice-President. The parade will begin shortly. 9.22 am: PM Modi arrives at Amar Jawan Jyoti at India Gate. He lays a wreath in respect to the nation’s martyrs. At Amar Jawan, an eternal flame burns, and a reversed rifle standing on its barrel and crested by a soldier’s helmet signifies the immortal soldier. Defence Minsiter Nirmala Sitharaman, MoS Defence Subhash Bhamre and Chiefs of the Armed Forces are present along with the PM. 9.17 am: Rajpath is about to come alive with a showcase of India’s military might and traditions coupled with the latest initiatives and achievements along with its rich diverse social and cultural heritage. WATCH it LIVE here! 9.05 am: If you’re at the Republic Day parade, you can deposit your remote control car keys — which are not allowed at the venue — at a facility set up in the Parking Area. There are two booths, one on the South side of Rajpath and another on the North of Rajpath. 8.58 am: Delhi traffic update: The national capital has been put under a blanket of security for Republic Day. The parade will move from Vijay Chowk towards the Red Fort via Rajpath, India Gate, Tilak Marg, Bahadur Shah Zafar Marg and Netaji Subhash Marg. For smooth passage, authorities have beefed up security and barred traffic movement in these areas. Here’s everything you need to know about the major traffic diversions, road services and metro timings across the city. 8.54 am: In a opinion column in The Indian Express today, Suhas Palshikar identifies four core challenges to the idea of republic. “Creating it was an act of audacity. Maintaining it is proving to be a daunting task,” he writes, in the column titled ‘Keeping the Republic‘. Palshikar a professor of political science and the co-director of Lokniti programme, CSDS. “Where we do not inconvenience our neighbours — while celebrating a festival or while resorting to a protest or on any other occasion. Where one can disagree with another viewpoint — or even with a historical context — without mocking a fellow citizen’s dignity and personal space. This is fraternity in action,” he added. Read the full text of his speech here. 8.40 am: Yesterday, on the eve of Republic Day, Congress president Rahul Gandhi had wished the nation and called on the people to defend the treasured commitments — justice, liberty, equality, fraternity. “More than ever before in the history of our young nation, we must defence these treasured commitments,” he wrote, in a letter to the nation. On the eve of our 69th Republic Day, I’m writing this #LettertotheNation, to remind ourselves of the commitments we made in our Constitution. 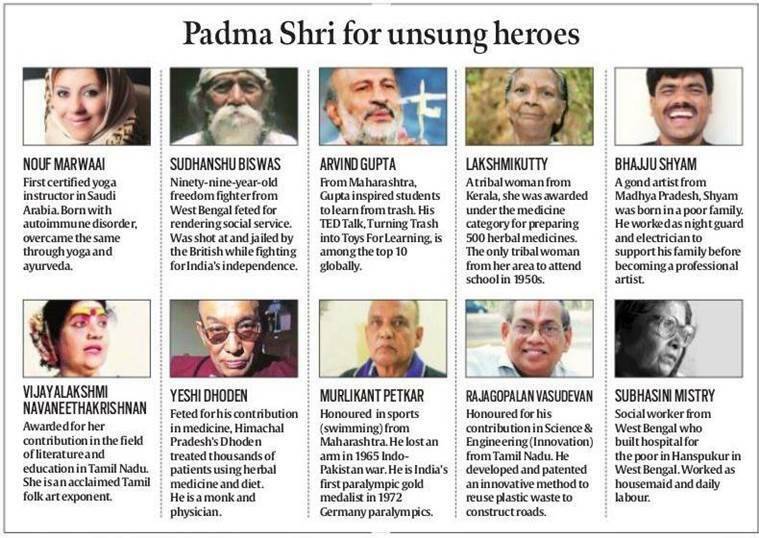 8.32 am: 85 distinguished people who have contributed immensely to society will be given Padma Awards — 3 Padma Vibhushan, 9 Padma Bhushan and 73 Padma Shri — by the President today. There were as many as 35,000 applications were received for the civilian awards this time. The list of awardees includes cricketer Mahendra Singh Dhoni, music composer Ilaiyaraaja, classical musician Ghulam Mustafa Khan and P Parameswaran. Read the full list here. These are the awardees for the category “Unsung Heroes,” which was introduced last year. 8.17 am: One of the main attractions at the parade today will be the Border Security Forces’ Women’s Motor Cycle team ‘Seema Bhawani’. Led by Sub Inspector Stanzin Noryang, they will display stunts for the audience, including Salute to President, Fish Riding, Side Riding, Faulaad, Prachand Baalay Shaktiman, among others. 8.13 am: The ASEAN leaders attending the parade today include PM of the Lao People’s Democratic Republic, Dr Thongloun Sisoulith; PM of Vietnam, Nguyen Xuan Phuc; Myanmar State Counsellor Aung San Suu Kyi; PM of Thailand, General Prayut Chan-o-cha; PM Malaysia Najib Razak; PM of Singapore, Lee Hsien Loong; PM of Cambodia, Hun Sen; the Philippines President Rodrigo Roa Duterte; Indonesian President Joko Widodo and Brunei PM Darussalam Sultan Haji Hassanal Bolkiah Mu’izzaddin Waddaulah. 8.10 am: For the first time, India has invited 10 Heads of State, of ASEAN countries, to attend the Republic Day celebrations. In light of this, the marching contingents this year will bear the flags of the ASEAN countries. There will be two tableaux showcasing India’s historical, civilizational, educational, religious and cultural linkages with the ASEAN nations as well. Also read | Republic Day 2018: Who all have been India’s guests in the past? 8.00 am: Welcome to our live blog on Republic Day 2018. The Republic Day celebrations, will commence at the Amar Jawan Jyoti at India Gate, with the Prime Minister paying respect to the nation’s martyrs by laying a wreath. At Amar Jawan, an eternal flame burns, and a reversed rifle standing on its barrel and crested by a soldier’s helmet signifies the immortal soldier. 1 Republic Day 2018: Who all have been India's guests in the past?